A compact Japanese flowering cherry tree with masses of frothy, classic cherry blossom in late spring and fiery autumn colour. Incredible springtime displays of an abundance of pink bowl-shaped, cherry blossom, a perfect, compact feature tree for any size garden. Prunus 'Pink Perfection' is a small deciduous tree with masses of frothy, classic cherry-blossom in late spring forming drooping clusters along the branches. The show of colour doesn't stop there either as the leaves open bronze, later green, with some orange tints in autumn, before turning bright red before they fall. An award-winning, British-bred small enough for planting in smaller gardens. Supplied as a bare root plant, ready for immediate planting, will grow to approx. 3m (10ft). Prunus serrulata 'Pink Perfection' is indeed hard to fault in any way - a great garden tree where space is limited, it forms a neat canopy of upright branches, smothered in the most gorgeous cherry blossom. The large, double, pink blooms are up to 5cm across and open from dark pink buds, forming drooping clusters along the branches. Lightly fragrant, they're a sure sign that spring has arrived! 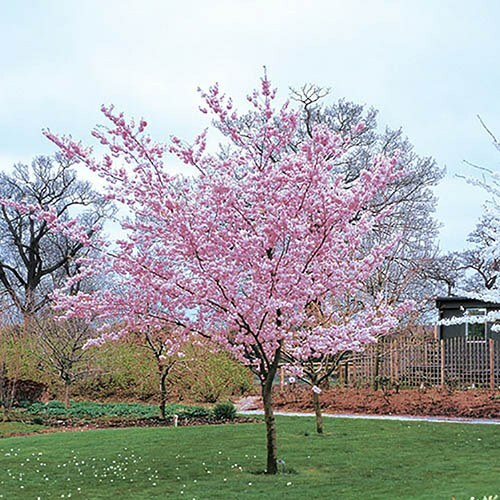 An award-winning, British-bred form of the widely planted and hugely popular Prunus Kanzan, Pink Perfection is a more compact, less vigorous form small enough for planting in smaller gardens. Supplied as a bare root plant, ready for immediate planting, will grow to approx. 3m (10ft). Like most cherries this lovely specimen tree prefers to be planted in a well-drained soil as it does not like getting its feet wet! Makes a super specimen for a lawn or spring border where it can be underplanted with bulbs, or why not create an avenue with a number of plants. Select an appropriate spot with enough space to allow your plants to grow. Use the best compost you can buy and some sand or grit for drainage. If you’re planting in spring or summer, water 'Pink Perfection' well and regularly for the first few months. To prune, simply remove any branches that are dead, damaged or diseased in midsummer after flowering. In general, no pruning is required.